The other night, a girlfriend of mine shared a disturbing story with me. She told me about a study where young girls had to take an academic test. In one version, they took it anonymously. In another, they had to indicate gender and say that they were female. On tests where the girls specified their gender, they did significantly worse! Something about identifying as female affected them negatively and impacted their ability to show off their smarts. This breaks my heart, not just for these young girls, but for all the ways we as adult women do the same thing. Even the most empowered of us have places in our lives where this plays out. Maybe your boyfriend thinks you're being overly controlling about something and you eventually give it up, even though you know something's not quite right. Perhaps you don't trust a situation intuitively, but you talk yourself into it anyway. Say your work is really important to you but your husband wants you to spend more time with him. Do you cave? And what if you give too much or say yes to things you don't want to do because if you don't, you'll feel guilty or it might cause a fight? I guarantee you that there are places in each of us where we act less than fully empowered. Through our thoughts about ourselves to the decisions we make to the kind of partners we choose. 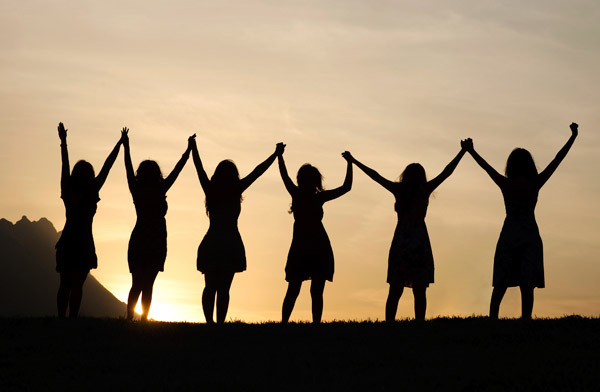 A good women's group will invite you into your very best, help empower you, provide healthy and loving connection, and help hold you accountable. On a consistent basis. It provides a safe place for you to keep returning to for support. Skilled facilitation. Unless you're all group leaders in your own right, you want to have one person whose job it is to have their eye on everyone in the group so they can help navigate conflicts, manage time, and be sure each woman is getting value at each gathering. Vulnerability. The group will go deep together, feel connected, and really touch the places in you where you most need support if every woman in the group knows how to be vulnerable, or if the facilitator knows how to invite that forth. Connections + Conflict. The group can't fully "gel" together, nor can it feel safe enough to get vulnerable if the group isn't willing to explore the connections or conflicts happening between the women in the group rather than pretending they're not there. And yes, they're always a part of the mix. Reflection + Impact. One of the most valuable things about a women's group is getting reflection from the other women about what you're sharing of yourself and how they feel hearing it. This is the gold of the group and often when the biggest breakthroughs happen. Challenge. I've been facilitating women's groups for over 7 years now and I've seen it over and over again: We default to being polite with each other. Without a healthy and loving dose of challenge, the group will keep playing polite and won't go deep. I challenge, invite, and encourage you to begin your search for a women's group today. If you're in the Boulder, CO area, check out this group or contact me for other suggestions (including men's group resources). If you're not near Boulder, google "women's groups" or "women's circle." Or, you could ask around at your local yoga studio, dance classes, meditation classes, spiritual community, or perhaps other places where women gather. No matter where you live, if you want to strike out on your own and start a group, I'm happy to help. If you've been in a women's group before, please leave a comment here and share how it was! Your comments help other women, so please speak up. If this post was useful for you, please share it on Facebook! PS - Dig this post? If so, don't miss others like it! Sign up for free updates from me.